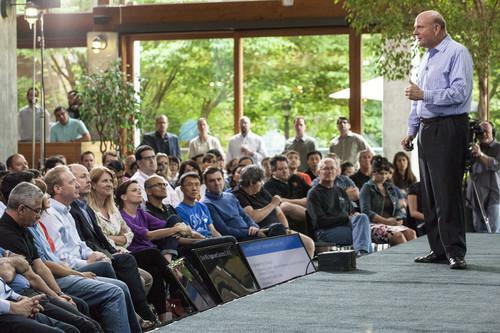 Microsoft CEO Steve Ballmer talking to employees about One Microsoft at a town hall meeting in July 2013, only about a month before he announced his retirement. However, Windows 8, which began shipping in October, has been heavily criticized due to its radically redesigned user interface, which is based on tile icons and optimized for tablets and other touchscreen devices. Ballmer has also shouldered the blame for the controversial and so far not very successful decision to have Microsoft manufacture and brand its own tablet, the Surface, an attempt to mimic the model popularized by Apple with its combination of iOS and the iPhone, iPod and iPad devices. In mid-July, Ballmer shook up the company's executive ranks with a broad reorganization billed as necessary to reinvent Microsoft as a devices and services company, and evolve from being a provider of packaged software. The reorganization, which is being implemented now, dissolved the company's five business units -- the Business Division, which housed Office; Server & Tools, which included SQL Server and System Center; the Windows Division; Online Services, which included Bing; and Entertainment and Devices, whose main product was the Xbox console. Those business units are being replaced by four engineering groups organized by function, around OSes, applications, cloud computing and devices, and by centralized groups for marketing, business development, strategy and research, finance, human resources, legal and operations. However, the plan has also met with skepticism among those who believe that it will lead to less accountability, less clarity and ultimately less agility. Others maintain that the "One Microsoft" mantra at the center of the reorganization is misguided because the opposite approach is needed, namely to reorganize it into more independent operating companies because it now houses businesses and products that are too different -- like the SQL Server enterprise database and the Xbox console. In particular, he's convinced Microsoft should have a CEO who is on board for the entire "transformation" process set off by the reorganization announced last month. "Our new senior leadership team is amazing. The strategy we have generated is first class. Our new organization, which is centered on functions and engineering areas, is right for the opportunities and challenges ahead," Ballmer wrote. Wall Street's response has been enthusiastic, with the share price up almost 7 percent in late morning trading.